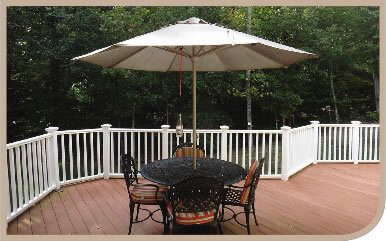 Q: We want to clean and beautify our deck for summer entertaining. Other than power washing it every year, what sort of cleaning regimen should we do? Although a pressure washer will remove winter's grime, there are cleaning and brightening products available, too, depending on the type of deck you have and the condition it is in. Penofin Pro-Tech wood cleaner is a good choice, which helps the cleaning process on all wooden surfaces and Trex by removing grease, grime, dirt, organic stains, tree sap and mineral deposits. It also works on driveways, garage floors, barbecues, and outdoor furniture. This product is bio-degradable, nonflammable and contains no VOC. Along with the cleaner, consider also using a brightening product, such as Penofin Pro-Tech brightener to help reestablish the PH balance of your wood after stripping and cleaning, and to brighten weathered wood to bring back that mill-bright color. Both products are concentrates that are applied very similarly once mixed with the proper amount of water. Once you have your proper solution, use a plastic pump-up sprayer or garden sprayer to apply the solution liberally. Wait 15 minutes and let it work for you. While it’s working, scrub it with a deck brush and then rinse thoroughly with water. A good deck cleaner and power washer will do the job. Once you have completed the cleaning, use a good finish to further protect the deck from the elements and keep it beautiful longer. Steven Lozano is the Paint Manager at Curtis & Campbell Inc., a division of Spenard Builders Supply. He has been with Curtis & Campbell for 24 years, from working in the warehouse to mixing paints to working the sales floor.